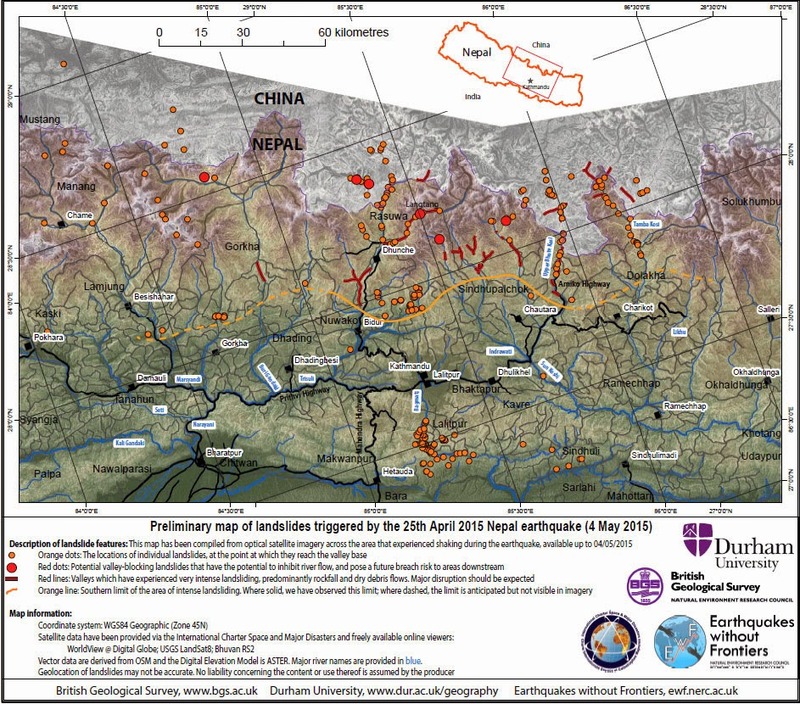 Placed above is a preliminary map of Earthquake Induced Landslides in Nepal (read Dr Dave Petley's report here). I am aware of a similar study being carried out by a team from the GSI in the Darjeeling-Sikkim region. With the SW monsoons knocking at our doorsteps and almost 3000mm of rain ahead (for Darjeeling district) in the next 5months, my biggest fear is how our injured mountains will bear up with this onslaught... and don't forget that 'developmental activities' such as road building and construction work including those of dams have gone ahead over the years, at breakneck speed in this entire region, with little regard to the environment. In the back drop of the recent earthquake in Nepal followed by temblor in the hills with epicentre located in Mirik and keeping in mind the approaching monsoon season ,the area may get hit badly by landslide in the coming months. The occurrence of earthquakes in steep landslide-prone areas greatly increases the likelihood that landslides will occur, either because of ground shaking or shaking-caused dilation of soil materials, which allows rapid infiltration of water. 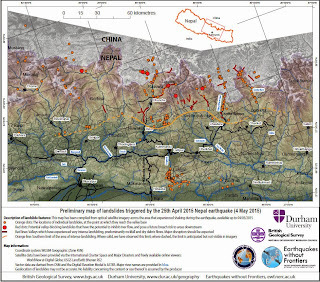 The second condition is more serious for Darjeeling considering the soil and rock conditions. The Darjeeling area may see an increase in landslides as an after effect of the series of recent earthquakes and onset of rainy season. Interestingly, it has been noticed that the rainfall pattern has changed in the region. The annual rainfall though has not changed much but the rainfall pattern is no longer uniformly spread over five months but happen in concentrated pockets over a short span of time mainly in July and August. This increases the runoff and chances of landslides increases. In order to increase the level of awareness and preparedness at both institutional and personal level following measures can reduce the risk to a certain extent. 1. Early warning system especially for heavy rainfall, landslide is an effective measure for saving lives. In the hills due to very spread out settlements it is important to set up a mechanism to transmit message across to villages. The banging of electric poles can be used effectively to alert people when power supply is down and SMS is not available. 2. Identify safe locations for each area and the knowledge of safe location should be communicated to the community. A general system needs to be practiced where community leaders can guide them to the safe house. Like practiced in Japan once a year a real time mock drill for evacuation may be useful to put down a protocol and understand the evacuation process. 3. In case of houses, which have been damaged in the recent earthquake or aftershocks. It is recommended to get a structural safety check done by a qualified structural engineer or Civil engineer. Architects are trained in design and basics of structures and can handle up to 4 storied buildings unless he or she has a specialization in structures. Draftsman and masons are equivalent to quacks please avoid their advise on design and structural safety. 5. Check for possible signs of landslides like tilting of trees, fences, and electric poles. Cracks in the lintel and sill of doors and windows. 6. Observe the weather closely everyday on your smart phone or Internet. A good practice is to keep a check on the weather forecast and warnings for the day. 7. Know the emergency contact numbers of the local fire service, police, disaster management department, ambulance etc. 8. Keep important documents inside plastic packet to protect from damage by water. Laminating important document is another of protecting the documents. 9. Preparation of an emergency kit at household level.